The walls of the Por-Bazhin Fortress were 10 metres high. The unique monument has been put on the list of Russia’s historical and cultural heritage objects. Taking part in a wide-scale scientific expedition today are more 200 people. After the excavations are over the work to restore the fortress with the use of local clay and wood – the materials it was made of – will begin. The Por-Bazhyn Fortress covers an area of 3.5 ha. Rising majestically skywards on the border of Mongolia in Siberia, at the headwaters of the great Yenisei, on the island of the picturesque Lake Tere-Khol, are the remains of some fortress walls. To this day they shield the mysterious Por-Bazhyn fortress, erected more than 1200 years ago in the time of the Uighur Kaganate. Why was it built? Who lived behind its walls? Are there hidden in the vaults of Por-Bazhyn the teeming treasures spoken of in local legends? How did the ancient builders manage to erect thousands of tonnes of clay and body bricks? For the fortress walls attain a height of ten metres and contained inside is a whole labyrinth of buidings. Por-Bazhyn is still enveloped by tales and legends. Academics believe that the fortress was built in the 8th century AD. The central palace, which stood on an elevated platform, belonged to the Uyghur Khan Moyun-Churu. The enigmatic ruins on the tiny island in the lake have long attracted the attention of travellers and academics. The first research of the fortress was carried out in 1891 by Dmitry Klements, an employee of the Minusky museum. In his archaeological diary he noted that this Tuvan monument “is the first among antiquities”. Klements also found external similarities between the ruins on Lake Tere-Khol and the remains of the ancient town of Kara-Balgasun on the River Orkhon in Mongolia. Academics resumed their research of the monument only at the end of the 1950s and 60s. An expedition led by Sevyan Vainshten closed in on the secrets of the fortress. Inside the fortress walls, archaeologists discovered 27 residential and servants’ quarters. In the central part of Por-Bazhyn the remains of two buildings were found which had apparently perished in a fire. Today, as a result of natural processes the ancient walls of Por-Bazhyn is gradually disappearing into the waters of Lake Tere-Khol, while the island territory is permanently shrinking. It is the opinion of specialists that in 3-4 years' time this unique monument of history and culture could vanish forever. The idea to conduct a full-scale archaeological excavation of the Por-Bazhyn Fortress was first voiced in October 2006 by the head of the Russian Ministry for Emergency Situations Sergei Shoigu at a meeting with students from the Tuva State University and received wide support from the very beginning. In order to implement the project, the Por-Bazhyn Fortress Cultural Fund was set up in January 2007. The Fund carries out work to select participants for archaeological expeditions and prepare and ship scientific equipment. On the Board of Guardians for the project are famous state, political and public figures. A Scientific Council was created within the structure of the Cultural Fund for the purpose of providing systematic supervision of the scientific work to investigate and preserve the historical heritage of the Por-Bazhyn fortress. The Council is headed by the academic Anatoly Derevyanko, director of the Institute of Archaeology and Ethnography of the Siberian division of the Russian Academy of Sciences. In conjunction with the Russian Academy of Sciences, a professional team of archaeologists, Orientalists and restorers was put together. 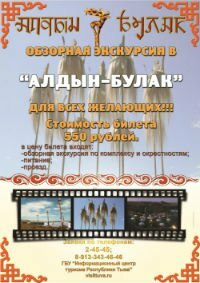 Taking part in the expedition will be specialists from leading scientific institutions – the Russian Academy of Sciences, the State Museum of the East, the State Historical Museum, Moscow State University, the Tuva Institute of Humanitarian Research and many other Russian scientific research organizations. The summer of 2007 saw the beginning of a comprehensive archaeological survey of the Por-Bazhyn fortress. The scientific investigation employs a full arsenal of modern methods. The academics are assisted by over 600 students from Tuva, Moscow, St. Petersburg and Kazan State Universities as well as Krasnoyarsk State Pedagogical University. A special competitive selection process was set up at the universities for those wishing to take part. All the candidates underwent a psychological test carried out by employees of the Centre of Emergency Psychological Assistance under the Russian Ministry for Emergency Situations. Thanks to the efforts of the specialists, prior to the start of the archaeological works it was possible to draw up a detailed topographical plan of the fortress and carry out laser scanning and a geomagnetic survey of the monument. On the basis of the data obtained, a 3-D computer model of the island was created to render in the minutes detail the relief and a map of the anomalies of Por-Bazhyn was drawn. The monument has been divided into six provisional excavations, each including various sites and objects. Several specialist archaeologists are working at each of the excavation sites, actively helped by the students. 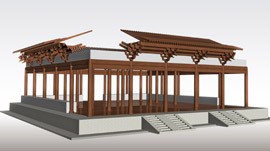 As early as the first stage the academics came to the conclusion that Por-Bazhyn was built under the strong influence of traditional Chinese architecture. Technologies widely in use during the time of the Tan dynasty were employed in the construction of the fortress. 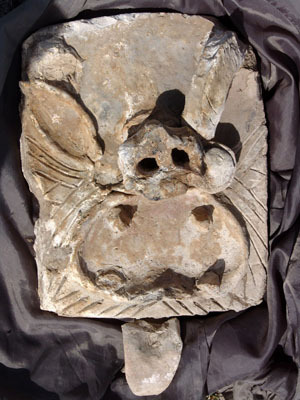 Images of large-eared Chinese dragons, which protected Por-Bazhyn from evil spirits, were found during the excavations. One more interesting find: not far from the fortress a rock quarry was discovered. Clearly, the lake looked quite different during the construction process. The rock quarry was situated right by the fortress and granite was delivered from there to the building site overland. Academics believe that the granite was used to build the foundation of the fortress. The project was planned to last more than one year. According to the results of the archaeological research a project to preserve the fortress will be drawn up. It is planned that the next few years will see the creation of a museum educational centre and national park. But the scientific community is already united in the opinion that the investigation and preservation of the Por-Bazhyn fortress, a monument of historical and cultural significance, is one of the most large-scale projects in modern archaeology.